Thank you so much beautyproductsreview for nominating me. This gives me an opportunity to get to know other people and their blogs and show them my appreciation. If you are not following BeautyProductsReview’s blog yet, I suggest you do. I have found myself checking out this blog before trialling out some items and it’s always fun to read about what others are trialling out in the beauty & cosmetics world incase you’re unaware of a hidden gem! 3. Colour of your eyes? 4. What was your New Year’s resolution? 5. Do you like to dress up for no reason? Yes. You never know who you might bump into! 6. Do you prefer dresses or skirts? 7. Did you have a Valentine for Valentine’s Day? 10. What did you do on Valentine’s Day? 11. What’s one thing that you know how to cook? I went on the Gossip Girl tour in New York and it was AMAZING!! Kardashians…love them or hate them? The skort..brilliant idea or just a bit silly? What are your top three hobbies? City/Country that you’d love to visit? Fifty Shades of Grey..Awesome or too much hype? Beach vacation or City Break? 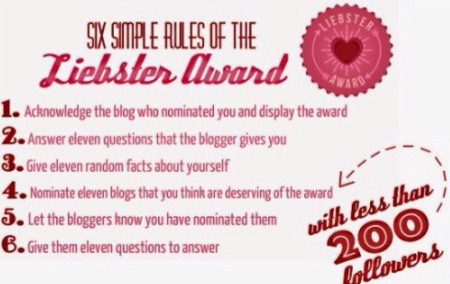 So here are the rules of the Liebster Award. Your New Year’s Resolution is the same as mine haha. Blogging takes so much time but it’s definitely a fun thing to do. ← Kaiser Chiefs – Public Service Announcement 2015 Tour… I was there! !